The engine is cooled by the circulation of water through the water jackets surrounding the cylinders, cylinder head, combustion chamber and valve seats. Circulation is by thermo-syphon action, assisted by a centrifugal type water pump, housed at the front of the cylinder block. A radiator fitted with a pressure cap forms part of the cooling system, allowing the engine to operate at a slightly higher temperature without boiling. Never remove the cap if the system is hot, but first allow to cool. Circulation is restricted during the warming up period by means of a thermostat fitted in the cylinder head water outlet. The cooling system is pressurised by means of a spring loaded pressure radiator cap. If the vehicle has been running and is hot, allow it to cool down before attempting to remove the radiator cap. Warning  Do not remove the radiator cap when the water is near boiling point, as this may cause water and steam to be blown back out of the filler neck at pressure, causing personal injury. Drain taps are fitted in the radiator bottom tank and in the cylinder block to the rear of the generator on the left hand side of the engine. Place a suitable bowl or bucket under the position of the drain taps. 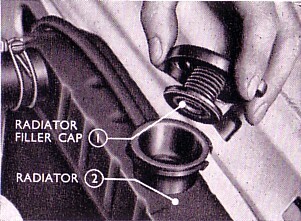 Remove the radiator pressure cap and the drain taps. If, when the radiator tap has been opened and the pressure cap is removed, water does not commence to flow immediately, insert a piece of wire to dislodge any sediment, which might be causing a temporary blockage, being careful not to damage any of the radiator fins. 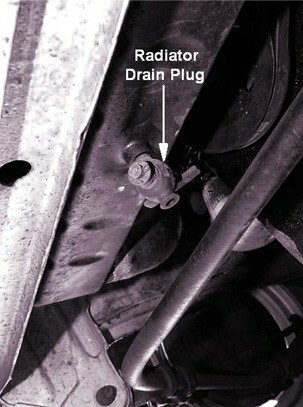 To drain the interior heater system, the heater hoses must be disconnected. Reconnect the heater hoses, flush the system out with clean water and then redo the drain taps. Fill the cooling system with an appropriate cooling system mixture. To protect the cooling system during frosty weather it is advisable to use an anti-freeze mixture. Should anti-freeze mixture not be available, drain all of the water from the cooling system, especially if the car is to be left standing for any considerable length of time. Glycerine or Ethylene-Glycol are solutions which are satisfactory for anti-freeze purposes, but all these are organic liquids which do not contain an anti-rust inhibitor. A suitable anti-freeze solution may be obtained from your Authorised Ford Dealer. NOTE - Salt solutions etc, can be extremely harmful and should not be used. If immediate frost protection is necessary, it is advisable to drain all of the cooling water away and mix the anti-freeze with clean water in a separate container and then add it to the cooling system. Periodically, have the solution tested, particularly in severe weather. If additional coolant is required, add water and anti-freeze solution in proportion. The following table has been compiled to give the percentage of FoMoCo ME-1163-B anti-freeze required to protect the cooling system of your car. If a heater is fitted, remember the cooling capacity will be increased and a proportional amount of anti-freeze should be added as shown in the table. 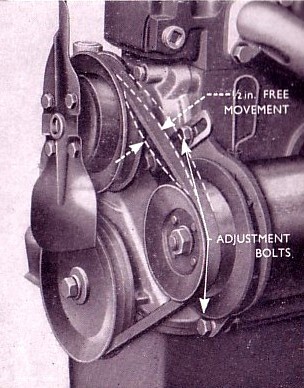 The same V-Shaped belt drives both the generator and water pump. The belt adjustment is correct when, as it is pushed and pulled at a point midway between the generator and water pump pulleys, the total movement of the belt does not exceed ½ in (12.7mm). A loose belt causes slip on the pulleys, while excessive tightness results in wear on the generator and water pump bearings and the belt itself. To adjust the fan belt tension, loosen the two generator lower mounting bolts, one at the front and one at the rear, then loosen the adjustment locking screw at the front of the generator. This will allow the generator to be moved outwards, the adjustment screw sliding in the slotted arm. When the correct tension is obtained, tighten all three bolts securely. Warning - The Health and Safety bit. Please note your health may be at risk if you do not take sensible safety precautions. Never work under an unsupported vehicle, do not take shortcuts. If you feel that the task is beyond your capabilities, then employ the services of a trained professional. The Owner of this Website nor the author cannot be held responsible for any accidents or injury arising from advice given on this webpage. Safety advice can be obtained from the RoSPA.